Calcium is one of the most essential minerals required by the body. It is needed for various metabolic purposes and for keeping bones stronger. It also plays a crucial role in determining muscular endurance of a person. Calcium insufficiency or, poor calcium intake or metabolism, are major factors which make bones and joints of the body weak and fragile. These deplete endurance and strength of entire musculoskeletal system and cause issues like osteoporosis, degenerative arthritis etc. Women are common victims of calcium deficiency than men but large percentage of males too suffer with poor calcium level and face bone and joint problems. Calcivon tablets are highly effective and beneficial herbal calcium supplements. These provide calcium in bioactive form and fulfil requirements of the body. These eliminate deficiency of calcium due to poor diet and low calcium intake or slow calcium metabolism and keep its level higher to provide strong musculoskeletal system and metabolic processes. 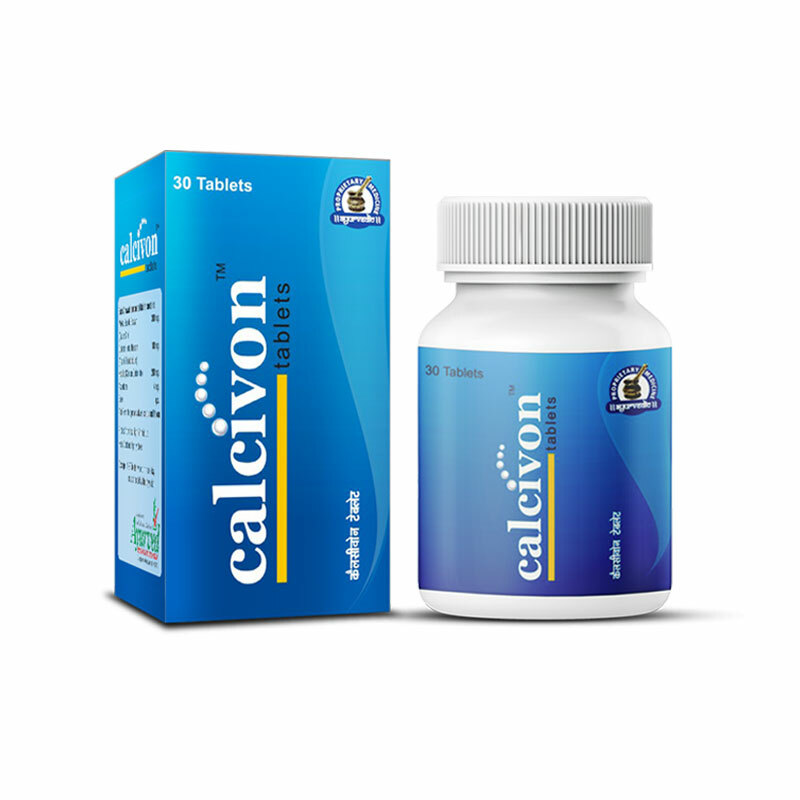 Calcivon tablets provide herbal calcium deficiency treatment by improving calcium metabolism. Body needs range of vitamins to utilize available calcium for producing bone tissue and to repair and rebuild damaged teeth, nails etc. people suffering with deficiency of calcium or vitamin D suffer with weak and thinning of bones and stiff joints. Herbal calcium deficiency treatment not only increase availability of calcium but also ensures its utilization to strengthen bones and entire musculoskeletal system including dentures nails, etc. body producing bone tissues in healthy amount replaces old and worn out bone tissues and maintain bone density. Healthy bones also stay protected from rigidity and brittleness which causes fractures and cracks after minor jerks and bumps. Calcivon tablets are natural supplements for bone health which do not cause overdose of calcium these supply it within healthy limit and prevent excessive calcium intake. These are excellent remedies for bone related issues occurring in men and women of any age and also for keeping joints healthy by maintaining bone density and flexibility. Supplement calcium in bioactive form to eliminate calcium deficiency. Provide range of vitamins for faster and complete calcium metabolism. Speeds-up production of bone tissues and increase bone density. Treat and prevent issues like osteoporosis, calcium reabsorption, thinning of bones and brittle bones. Improve joint health and endurance. Increase muscular endurance and provide strong musculoskeletal system. Improve health of hairs, teeth, nails and maintain various metabolic processes. Consume one or two pills every day after breakfast and dinner on regular basis. You can use it as preventive remedy too if you fear of suffering with calcium deficiency or bone issues. I was having early tooth decay, and was prone to cavities. I started taking Calcivon tablets two times a day. Now I have perfect smile and I am taking these tablets regularly. I like Calcivon tablets. It improved my weak bone health. I will re-order again. I just love Calcivon tablets. It is a great way to get your calcium through plants, rather than other forms that the body can’t readily absorb. Love this Calcivon calcium tablet. I do not plan to be without it anytime soon!